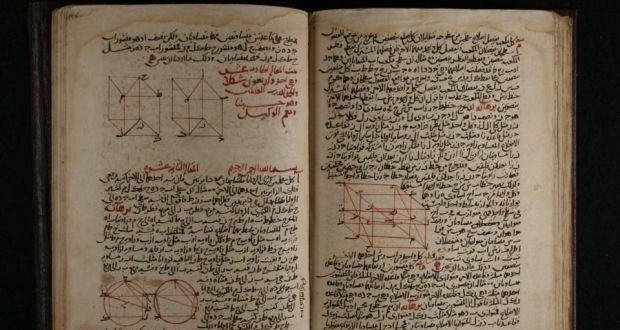 Arabic Translation of Euclid’s Elements. Sylvain Gouguenheim is a professor of medieval history at the l’École Normale Supérieure de Lyon in France. In 2008 he published a book with the title Aristote au Mont Saint-Michel (Aristotle on Mont Saint-Michel). The book was about Islam’s contribution to European culture in the Middle Ages. A few decades ago a book like this might have been read mostly by academic experts who then would have discussed it in academic journals. However, we are now living in different times and the book caused a scandal in France, and later also in Germany where it was also published. It was discussed and reviewed in newspapers like Le Monde and Libération in France, in the Frankfurter Allgemeine Zeitung in Germany and in the New York Times in America. What was about the book that upset so many people? It was the statement by Gouguenheim that Europe built its own civilization itself and that the ancient culture of the Greeks is at the roots of this civilization. Rationality, which is often called, improperly, “Western”, came like the light, from the East (p. 113). The whole european civilization was built without any doubt with the help of Islam [ … ] Only through Arab thinkers did Europe learn rationalism (p. 5). It was the intellectual flowering of the Cordoba caliphate [in Spain in the Middle Ages] that helped to protect and transmit ancient Greek texts and eventually to propel the European Renaissance. How were Muslims able to play such a decisive role in creating European culture? During the flourishing of the Roman Empire Greek philosophical and other texts were not translated to Latin; there was no need for that, as members of the Roman elite who were interested in those works were able to read Greek. However, after the demise of the Roman Empire in the West the number of people who could read Greek decreased substantially. As a result, books in Greek were not needed, they were not copied, and many of them were presumably lost. Thus, when, starting in the the 8th and 9th centuries, Europeans became interested in classical Greek writings again, there was a need for the classical Greek texts. Some were available in some European cities, e.g. in Rome, in the library of the Pope. Many others were available in the Eastern Roman Empire (Byzantium) and also in the previously Christian Middle East, by this time ruled by Muslims. This large scale translation movement, which, using the words of Boris Johnson, “preserved” these books, was supported by the Abbasid caliphs and by Muslim elites. The translated books were then copied and found their way into libraries in the Muslim world, among them also in Spain, large parts of which were under Muslim rule from 711 A.D. on. But a re-conquest (reconquista) of these territories by Christian rulers soon started, and by the end of the 11th century almost half of Spain was in Christian hands again—including the city of Toledo, which was re-conquered in 1085. It was there that Christian scholars discovered Arabic language translations of many classic Greek authors, among them Aristotle. Some of these Christians learned Arabic to be able to translate these texts into Latin, which was the lingua franca used among scholars at the time. The major figure of this translation movement was Gerard of Cremona. In 1165 A.D., 80 years after Toledo came under Christian rule again, Gerard started publishing translations of many of these Arabic-language versions of Greek works into Latin. This was a knowledge transfer from the Greeks to the Western Europeans which supposedly wouldn’t have been possible without Muslims “preserving” the Greek classics by translating them into Arabic. The assumption is that these translations were then used to quick-start the development of European natural philosophy, which then ultimately led to the Renaissance and the Scientific Revolution. Another way Islam was supposed to decisively contribute to the creation of European civilization was more subtle: it was by enriching European ideas and thinking, for example by interpreting and commenting the writings of classical Greek philosophers, in particular Aristotle. These comments were also translated and helped European scholars to gain new insights. The debt to Muslim scholars is, for the most part, unacknowledged by European scholars who drew upon their work. We should counter anti-Islamic scare-mongering by recalling our debt to the culture of Muslim Spain. As a student of history, I also know civilisation’s debt to Islam. It was Islam—at places like Al-Azhar University—that carried the light of learning through so many centuries, paving the way for Europe’s Renaissance and Enlightenment … And throughout history, Islam has demonstrated through words and deeds the possibilities of religious tolerance and racial equality. Chancellor, ladies and gentlemen, if there is much misunderstanding in the West about the nature of Islam, there is also much ignorance about the debt our own culture and civilisation owe to the Islamic world. Many people in academia, politics and media state that Islamic civilization played a “decisive” role in establishing European cultural identity. A “debt” to Islam is supposed to exist in at least two ways. First, the Islamic civilization “preserved” classical Greek knowledge via Arabic translations of Greek works. This made a transfer of this knowledge to Europe possible (I call this the “knowledge transfer debt”). Second, ideas developed by Muslim scholars and scientists were supposed to have enriched European intellectual life (I call this the “enrichment debt”). Gouguenheim doesn’t agree that Islam played a “decisive” role in establishing European cultural identity (at least not in the way as it is meant by people like de Libera). He claims that Europe itself played that decisive role. Part 2 will describe how he justifies this claim. Later Parts of this article series investigate the validity of the two “debts” in detail. In this, I roughly rely on Gouguenheim’s arguments, but include other sources as well, when it seems appropriate.